The British Isles are a treasure trove of history and ancient sites. No wonder so many cruise lines have itineraries that include England, Scotland, Northern Ireland, the Republic of Ireland, Wales and even the tiny, independent Isle of Man. Whether you love towering castles, prehistoric standing stones, soaring cathedrals, astonishing landscapes, impressive architecture or just a bit of blarney, it's all there. 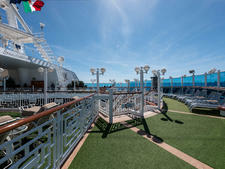 In fact, there are so many itinerary choices and so many ports of call that you might find it all a bit boggling. We know the dilemmas all too well because we're just back from a Gaelic Explorer cruise on Windstar's Wind Surf, where we visited spectacular sites in Scotland and Ireland -- but there's still even more to see. We've collected the top historic attractions (not counting those in London) every traveler should visit in the British Isles, along with the cruise lines that will take you there. 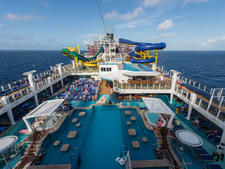 With this list, we guarantee you'll have a jolly good time. Stonehenge: Britain's most iconic ancient site has got to be Stonehenge, which still hides many mysteries. Started as long as 5,000 years ago, the vast complex held great significance for the ancients. The circles of stones include 50-ton megaliths, which were dragged 20 miles from where they were quarried. You have to see it in person to fully realize the monumental task that these ancient worshippers completed. The setting operates as a solar calendar, but beyond that, little is known, though research continues. While you're not able to walk among the stones, you feel their power even gazing at them from behind a low fence. Tip: Many shore excursions to Stonehenge also include Salisbury, famous for its 13th-century cathedral, graced with the tallest spire in England. The town itself is delightful, with half-timbered houses, medieval walls and a sprinkling of other architecture through the ages. 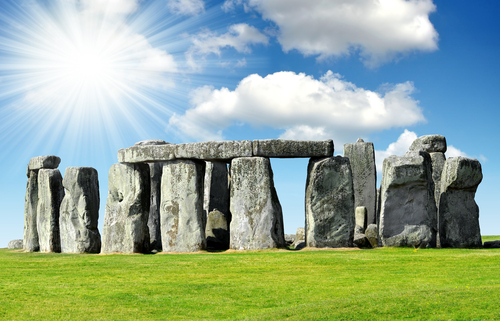 It's well worth choosing a tour that takes you there, as well as Stonehenge. Bath: Bath has been attracting tourists ever since the Roman era, thanks to its natural hot springs. When you visit, you can see the remains of the Roman baths, as well as the 18th-century baths that were all the rage among Georgian high society. The town gets its look today from that era, with terraced houses and lovely crescents, where the facades form a curve. The whole city has a golden hue, thanks to the stone used to construct most buildings. 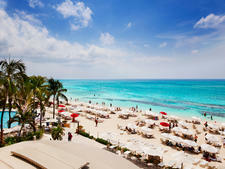 When you visit, you'll soon understand why entire place is designated as a UNESCO World Heritage Site. Tip: Bath is also home to a modern facility, Thermae Bath Spa, with a vast open-air thermal pool where you can take in the waters (and some great views), just like in times past. 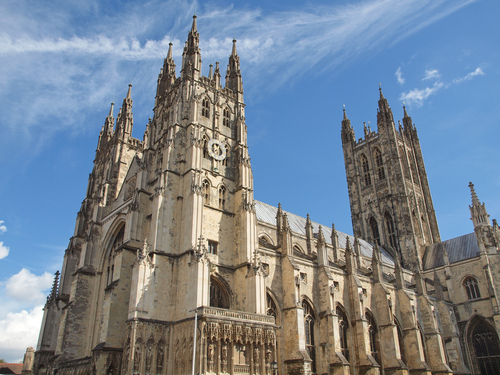 Canterbury Cathedral: If the name Canterbury rings a bell, it's probably thanks to the famous "Canterbury Tales" by Chaucer. His fictional book features stories told by pilgrims who traveled from London to visit the famous Gothic cathedral. Today, it's still the main seat of the Anglican church, with a rich history to explore. Thomas Becket was murdered there in 1170 and sainted shortly thereafter, inspiring thousands of pilgrims to visit. The cathedral is also home to a "who's who" of tombs, including many archbishops and Edward the Black Prince. But, in the end, the architecture alone will wow you. Tip: The Romans were also in Canterbury, and the Roman Museum in Canterbury includes mosaics and a reconstructed marketplace. Edinburgh's Old Town: Crammed onto high ground near Edinburgh Castle, Old Town is a wonderful mishmash of narrow streets, dead-end alleys and towering (for the 16th century, at least) tenements that can reach six stories. There are intriguing little shops tucked away on streets like West Bow, though most visitors head for the Royal Mile, the byway that connects the castle with Holyrood Palace. Edinburgh Castle is a must-see. It's more of a complex than a single castle, with structures ranging from the 12th century to the 16th century. There's much to check out, including the Scottish royal jewels (known as the Honors of Scotland); the Great Hall, with its intricate 16th-century roof; and the castle vaults, with carvings made by prisoners of war hundreds of years ago. The views are spectacular, and if you're there at 1 p.m. (except Sundays), you can also witness the firing of the One O'Clock Gun, a tradition dating to 1861, which helped mark the time for ships in the Firth of Forth. 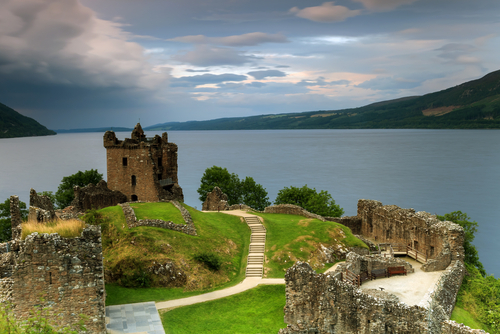 Tip: If you can, choose a tour that also visits the Loch Ness Centre & Exhibition in nearby Drumnadrochit. It presents the cases for and against Nessie from a scientific perspective and also analyzes some interesting hoaxes. Neolithic Orkney: The main island of Orkney is riddled with prehistoric sites, earning it a place on the UNESCO World Heritage list. There are burial mounds, standing stones and the remarkable 5,000-year-old stone homes of Skara Brae. Most shore excursions will focus on Skara Brae and a nearby 18th-century country home called Skaill House. The Skara Brae community was discovered in 1850 after a raging storm shifted the sand dunes that had hidden it. You'll look down into the simple domiciles from raised pathways. Because nearly everything was built with stone, it was remarkably preserved; you'll be able to see shelves, beds and even what's believed to be a tank for keeping live fish. Before heading out to the site itself, be sure to visit the reconstructed home as you exit the visitors' center. Our shore excursion also included a stop at the Ring of Brodgar, an evocative circle of standing stones, as well as drive-bys of other sites. Tip: If you're short on time, we'd recommend a quick dash through Skaill House and a more lingering visit to Skara Brae and its excellent visitors' center. You'll also get better photos at Skara Brae if you don't stick closely to your group. 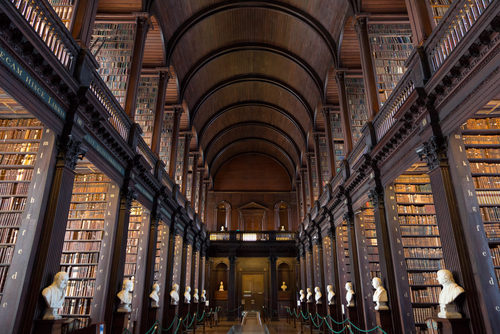 Trinity College and the Book of Kells: The Book of Kells is the rock star of medieval manuscripts. Scholars date the work to around the year 800 and believe it was created on the Scottish island of Iona (which you can visit from a port call in Tobermory), then transferred to Kells in Ireland for safekeeping following a Viking raid. The lavishly decorated manuscript contains the four gospels, written in Latin, and has resided at the Old Library of Trinity College Dublin since the mid-1800s. When you visit, you'll first enter the "Turning Darkness into Light" exhibition, which sets the context for the Book of Kells. You'll then proceed to the Treasury, where two of the book's four volumes are displayed, one opened to show a major illustration and the other opened to text. There are additional fine manuscripts shown there, as well. You'll also get to tour the main section of the Old Library, called the Long Room. This impressive chamber, lined with marble busts, houses 200,000 of the library's oldest books. Tip: 500,000 people visit the Book of Kells every year, so the exhibits can be crowded. One strategy is to visit at lunchtime to avoid the worst crowds. 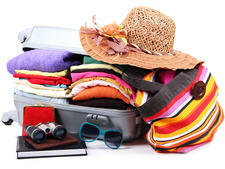 If you're an independent traveler, it's possible to book timed tickets online. Blarney Stone and Blarney Castle: According to legend, if you kiss the Blarney Stone, you'll get the "gift of gab," or "eloquence," as the stone's keepers prefer to say. This isn't the easiest of tasks, because you have to first climb up to Blarney Castle's parapet, then bend over backwards to kiss the stone while holding onto metal bars. (Take heart, though -- in the past, visitors were held by the ankles and lowered to put lips to rock.) The castle and stone date to 1446, and many tales surround the stone's origin. The castle itself is a partial ruin, but it's possible to visit several rooms. Tip: The castle is surrounded by gardens, including an Irish garden, a fern garden and a bog garden. But the most unusual of all is the Poison Garden, home to poisonous plants from around the world. The Poison Garden is where you'll find Harry Potterish species like wolfsbane and mandrake, as well as ricin, opium and cannabis. Placards describe their history and uses. The Giant's Causeway: Formation of the Giant's Causeway began 60 million years ago with volcanic activity. 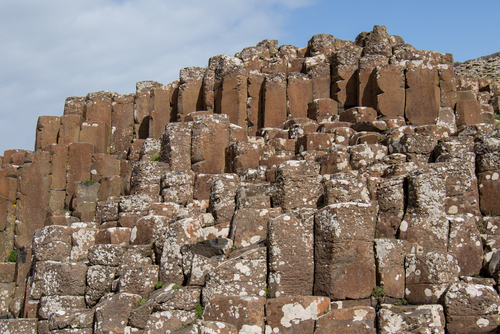 Over time, lava eruptions and flows formed more than 40,000 basalt columns, most with six sides, creating a honeycomb effect. Erosion and shifting seas finally revealed them 15,000 years ago. Legend says they are part of a giant's pathway, built when an Irish giant challenged a Scottish giant to a battle. (Indeed, there is a similar formation across the water on the Scottish island of Scaffa.) Visit the Grand Causeway, and step from column to column. Don't miss a photo op sitting in the Wishing Chair. More distant sights include the Organ Pipes and the Giant's Boot. There's also a visitors' center, offering food, shopping and exhibits illuminating the causeway's formation and myths. 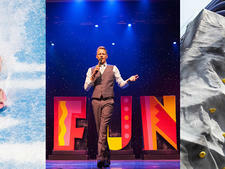 Tip: Weather can be blustery there on the Antrim coast, so dress warmly, and carry rain gear. You can grab a welcome cup of coffee at the visitors' center. Belfast's Peace Walls & Murals: For years, Belfast was a battleground between Protestants and Catholics, loyalists to the British crown and those who wanted to become part of independent Ireland. "The Troubles," as they were known, are mostly a thing of the past, but those interested in Northern Ireland's political history can visit moving and impactful remnants of the city's struggles. The so-called peace walls were built to separate Protestant and Catholic communities, and now they're covered with graffiti and wishes for peace from around the world. The Cupar Way wall, separating Falls Road (Catholic) and Shankill Road (Protestant), is one of the most vivid. Belfast is also home to more than 300 murals, most depicting a political point of view, including memorials to the Hunger Strikes of 1981 and those promoting loyalist paramilitary groups. New development are murals promoting peace and accord. Tip: A black-taxi tour is a great way to see the peace walls, murals and other Belfast sights. Drivers can tailor tours to your interests and give you a personal perspective on "The Troubles."